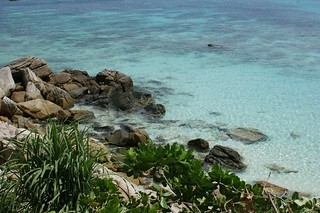 Our trip to Malaysia ended in Pulau Perhentian after few days trekking in Taman Negara National Park. These Islands, only accessible by boat from Kuala Besut, are located in North East of Malaysia (40 km from the Thailand border). 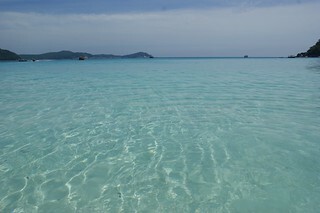 The 2 main islands, Perhentian Kecil and Perhentian Besar, are occupied and opened to tourism. This post is the last of the Philippines Trip that I did with 3 French friends from Beijing (published almost 4 months after we came back… sorry for the delay). After accumulating misfortunes at the beginning of the trip, enjoying the sea and beaches and riding motorbikes to explore the back-country, we ended our trip with a complete scuba-diving day in the Bacuit Archipelago. Tough program for our scuba-divers’ team: full day on a boat with 2 dives in the morning, a picnic on a marvelous beach and a third dive in the afternoon. I highly recommend Submariner Diving Center El Nido who provided us an amazing service: extremely detailed explanations for the beginners from the dive master, good quality equipment, only 2 additional Russian divers on the boat (6 in total)….